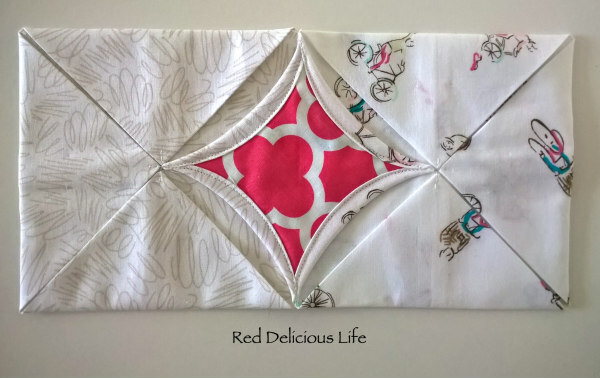 Fabri-Quilt New Block Hop & A Giveaway! 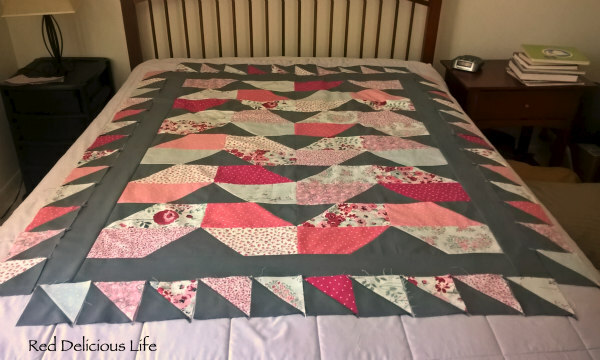 Hello Everyone and welcome to my stop on the Fabri-Quilt New Block hop! Fabri-Quilt was very generous to sponsor this hop and provide all of the participants with the fabric free of charge. When it came time to design a block, that turned out to be much harder than I thought. Oh the choices! Lucky for me I have EQ7 and after playing around a bit I've decided to show you how to make 2 blocks! 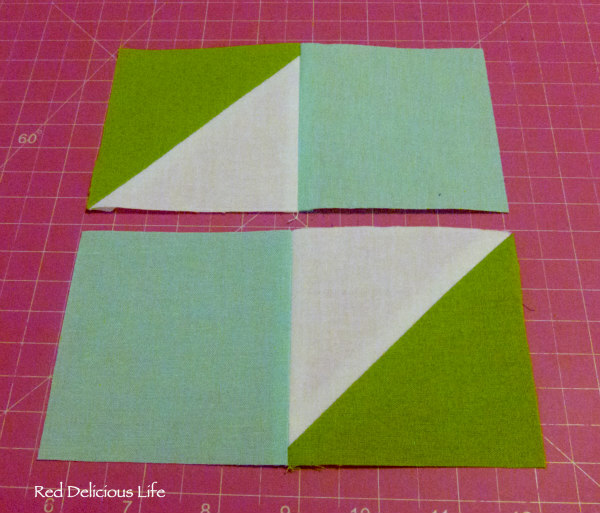 The one on the left is a paper pieced block and the one on right is standard pieced block. Let's get started, shall we? 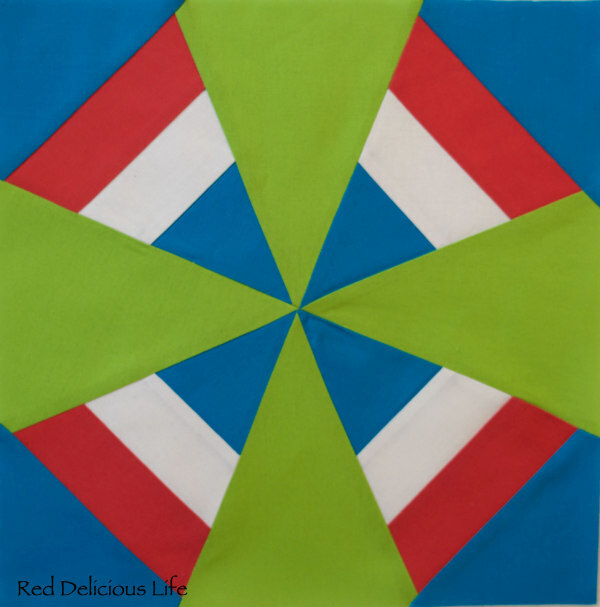 I'm calling it the Dutch Windmill Block because the large triangles look like the sails on a windmill. What I really like about this block, though, is the secondary pattern the emerges when you make an entire quilt with them. I love that it gives you the illusion of curves. 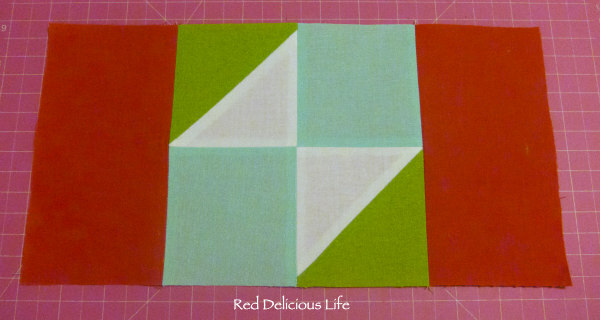 This block is paper pieced but it's a pretty easy one. Anyone who's followed me for a while knew that I had a fear of paper piecing less than a year ago, and look at me now -- opting to create a paper pieced block! Who knew, right? 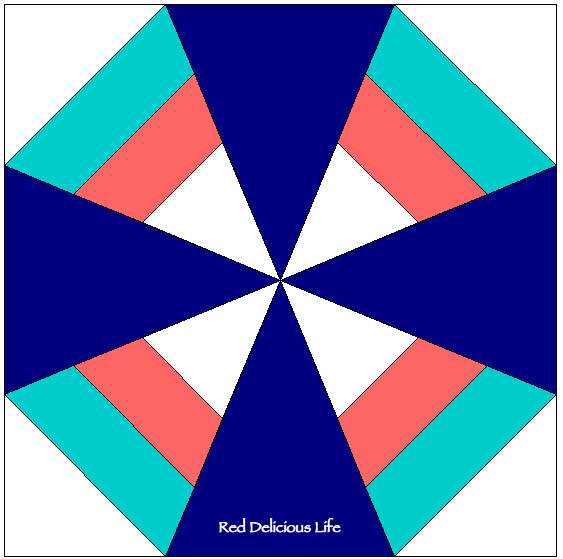 If you are a seasoned paper piecer skip the rest of this post and just print out the Windmill Block pdf on Craftsy to get started (print out 4 copies as you will need 4 smaller blocks to make the full 12.5" block). Since there are so many great tutorials online, I'm not going to reinvent the wheel by making another one. 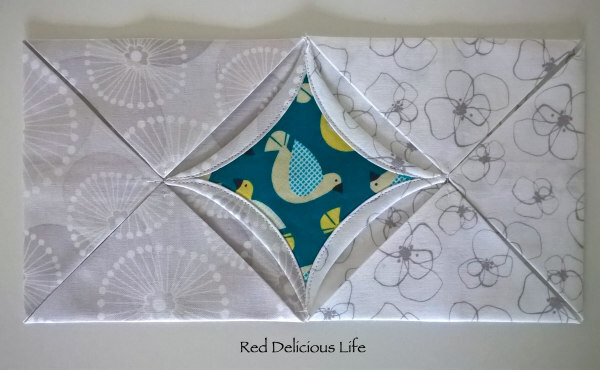 I recommend these two tutorials - they are the ones I used to learn paper piecing. Add-A-Quarter straight edge. 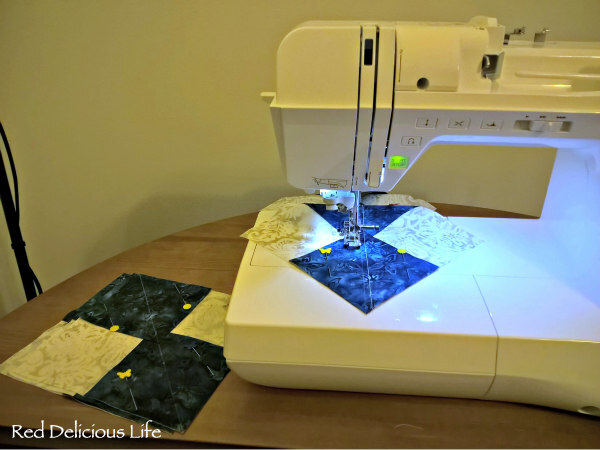 Definitely not required, but it's awesome for paper piecing. 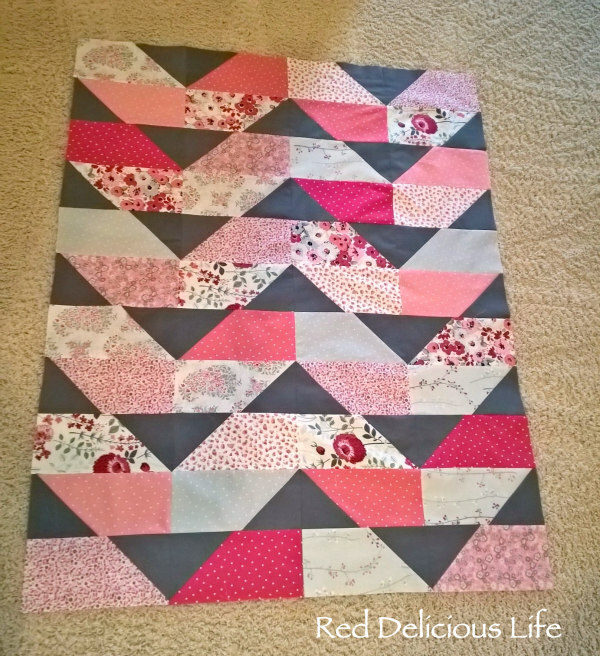 Remember, In order to make one 12.5" block, you need to make 4 smaller blocks and sew them together. 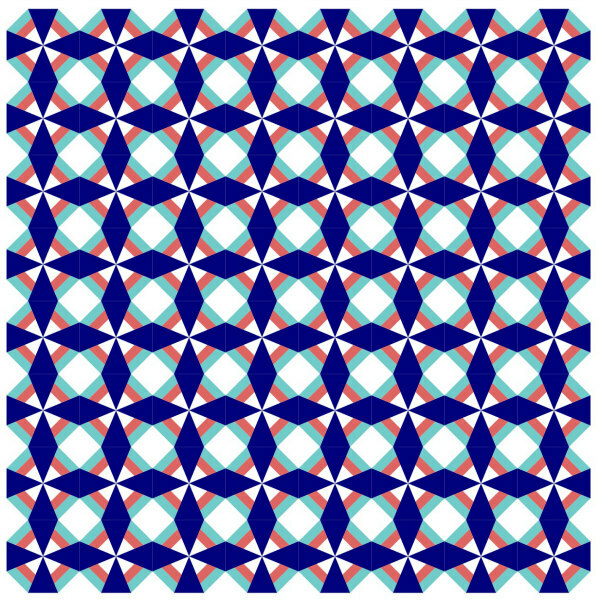 Print out 5 copies of the Windmill pattern. When printing, be sure to set your printer to 100% (not scale to fit), so that it prints out to the proper size. You might also need to set it to print in landscape. Make a template. The pattern states to print out 4 copies but I always print out an extra and cut out each individual number, making sure to include the seam allowance line where applicable. 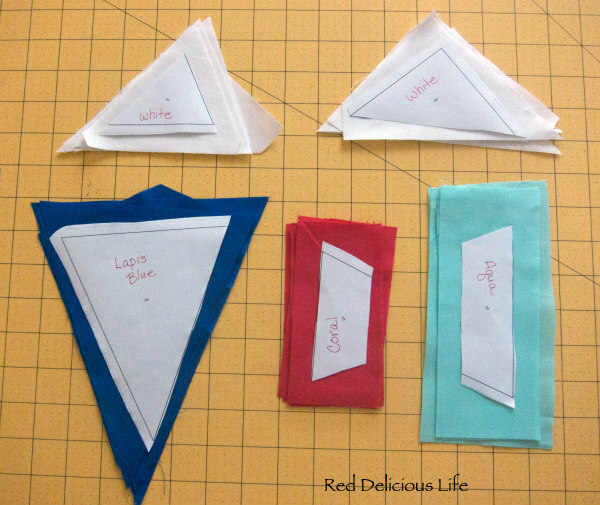 I use these as templates to cut out my fabric so I don't accidentally have a piece of fabric that is too small. Another thing I like to do is on each pattern template, I write the color of the fabric that I intend to use, just so I don't make any mistakes when piecing. Remember when sewing, shorten your stitch length to make it easier to remove the paper later. 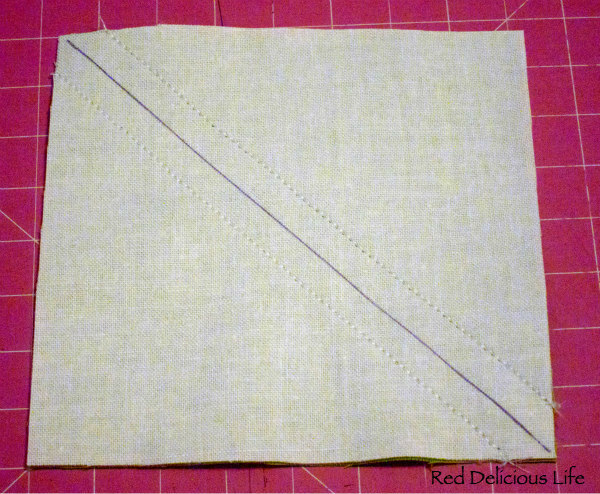 As you're stitching and you reach the seam allowance line, it's okay to sew into that area. In fact, I encourage it. That insures that you won't have any loose stitches by the time you actually sew those seams together. 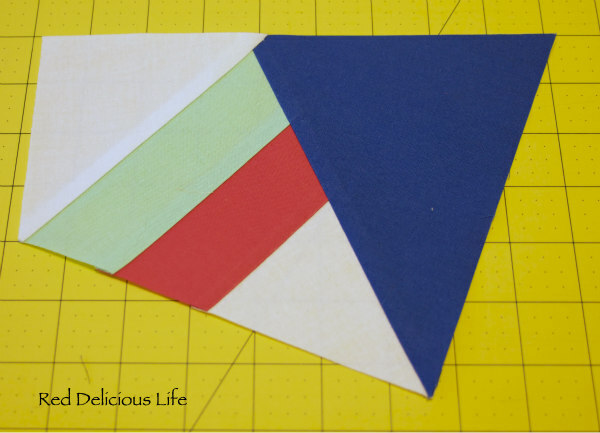 My last advice when paper piecing - don't trim your outside edges until your block is completely constructed. That way you can trim it down to size, just to be safe. 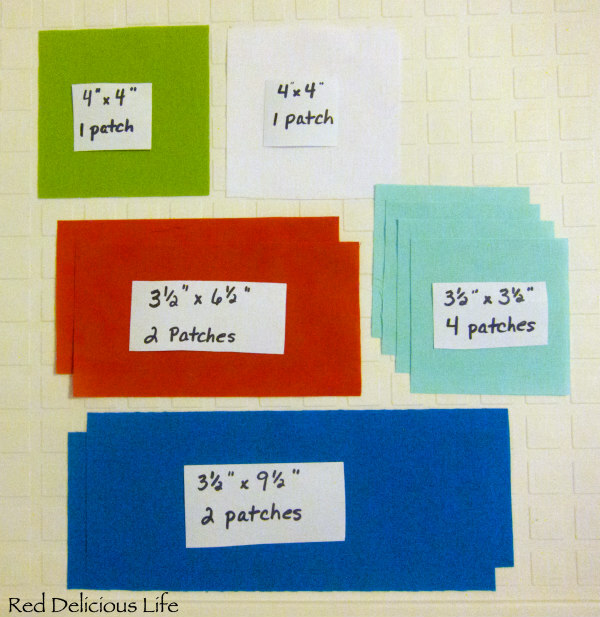 I like to cut out all my fabric at once, so the numbers below are enough for all 4 printouts. Template A2 (coral) = 4 pieces, approximately 3" x 5"
Template A3 (aqua) = 4 pieces, approximately 3" x 7"
The dimensions on the rectangular shapes are very generous, but that is how I ensure I have enough fabric. Now, if you're still with me, ready to tackle the second block I made? Great! This second variation has every other block rotated and flipped (meaning that you actually sew one of the strips upside down). I like this one because of the basket weave effect it has. 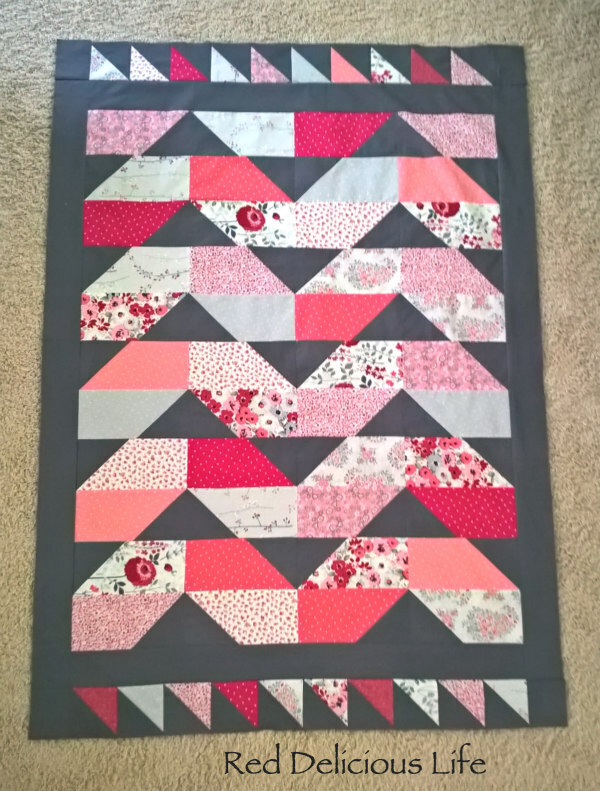 A few things to note before we get started -- all of my seams are a scant quarter inch and for this block I pressed them all open. Okay then, let's do this! This will make one 12.5" block (12" finished). 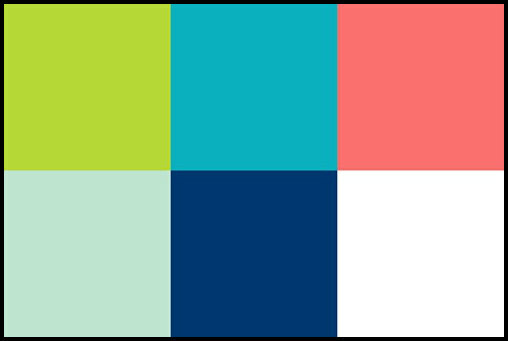 Aqua: 4 squares 3.5" x 3.5"
Turquoise: 2 rectangles 9.5" x 3.5"
Coral: 2 rectangles 6.5" x 3.5"
White: 1 square 4" x 4"
Chartreuse: 1 square 4" x 4"
Place one white and one chartreuse square right sides together. Draw a line diagonally from corner to corner. Stitch a scant 1/4" on both sides of the draw line. Press and trim each HST down to 3.5" square. 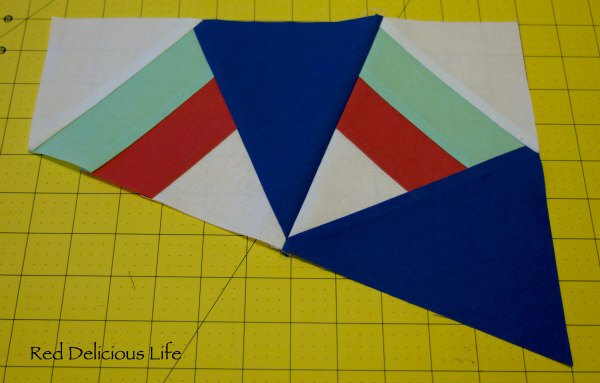 Sew 1 aqua square to each of the half square triangles, sewing along the white edge. 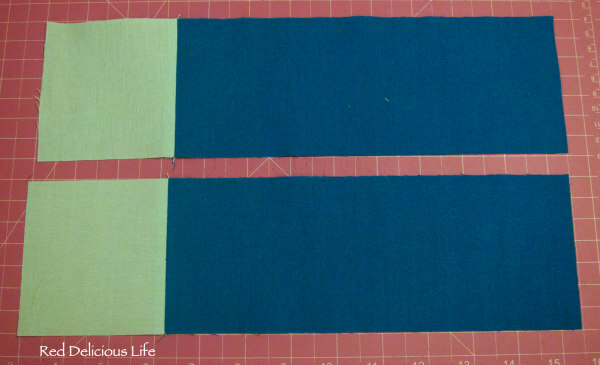 With solid aqua squares opposite of one another, place both pieces right sides together and sew. 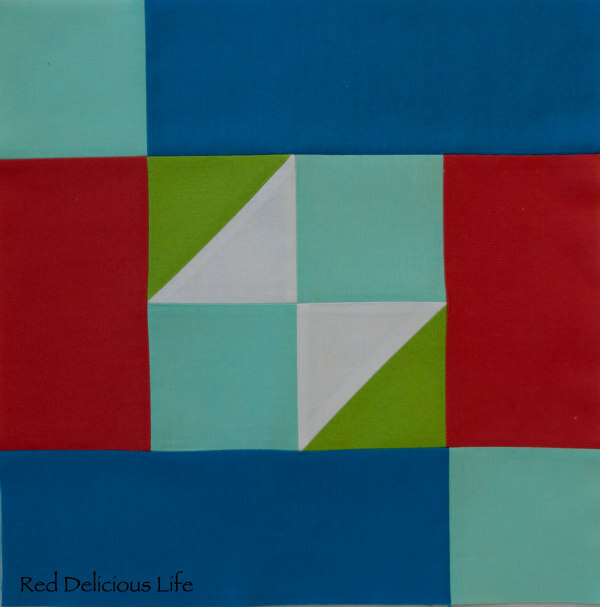 Take your last 2 aqua squares and sew them to the turquoise pieces. 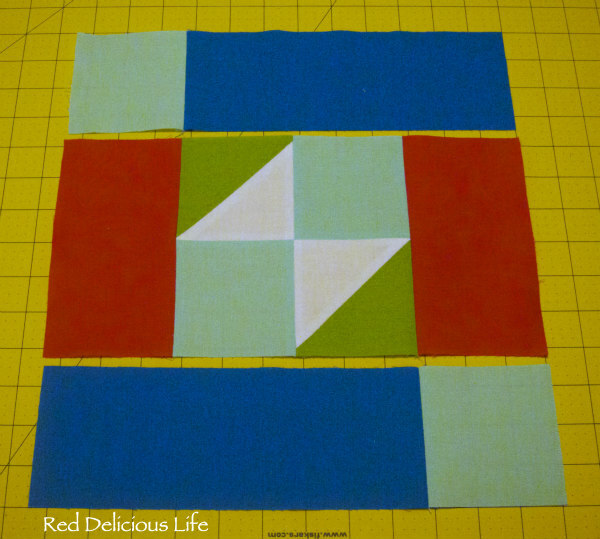 Lay out the block so that you have the aqua squares in the upper left, and the lower right corners. Sew, press, square up, and you're done! Want a chance to win your very own half-yard bundle of Watermelon Summer fabrics? 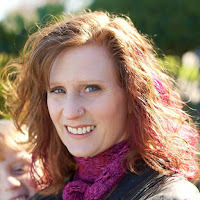 Be sure to head over to the Inspired by Fabric blog and today's host Yvonne's blog Quilting Jetgirl for 2 chances to win. If you are one of the lucky winners, I want to recommend that you prewash your Fabri-Quilt Prairie Cloth Solid fabrics with like colors. Diana @Red Delicious Life - that's me! Back to School = Back to Sewing! 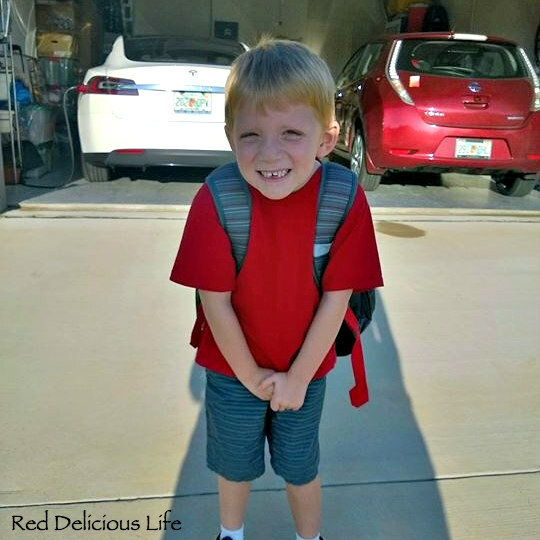 Today was the first day of school for my little guy. He started kindergarten so that means buses and a full day without me having to go back and forth to get him during lunchtime (which was last year's scenario). 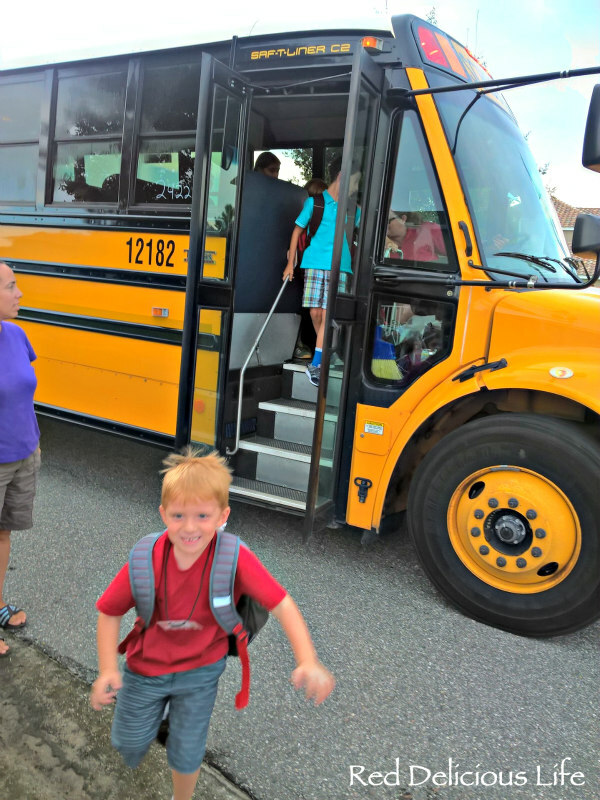 Despite his nerves of starting a new school, he was pretty excited once he saw all the other kids waiting at the bus stop. Once he was on the bus, I was excited to get back into my sewing room to catch up on some projects. 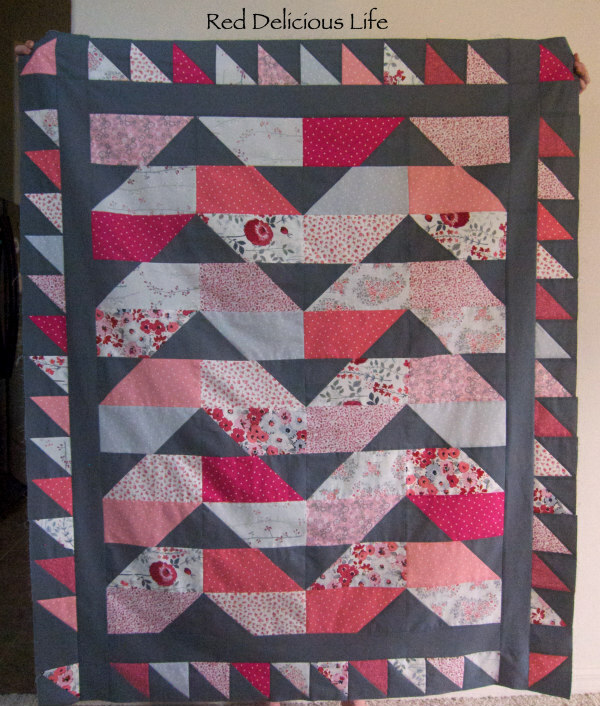 First up, was my August assignment of making flying geese for the Midnight Mystery Quilt Along. I got my geese all sewn (still need to clip the dog ears and trim them down to size) while watching the current season of Orange is the New Black, and even went out to lunch with my husband. Overall, it was a wonderful day. And judging by the excitement of my son (and the blur of him running to greet me), I think he had a good day too. Despite all the things on my plate right now, I managed to finish up the borders on my niece's quilt top and I couldn't be happier with how it turned out. I'm feeling really good about how well August is going so far. Just a few more smaller projects to finish up and maybe I can get to quilting this soon. Have a great weekend! Ever since I started quilting 3 years ago, I always wanted to try making a cathedral window block. This was my lucky month since that was what we were asked to make. I was so excited and pleased with how deceptively simple they are to make, that I made 2. 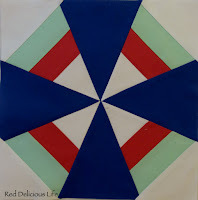 Plus, check out this great tutorial from Missouri Star Quilt Company on a different way to make them. 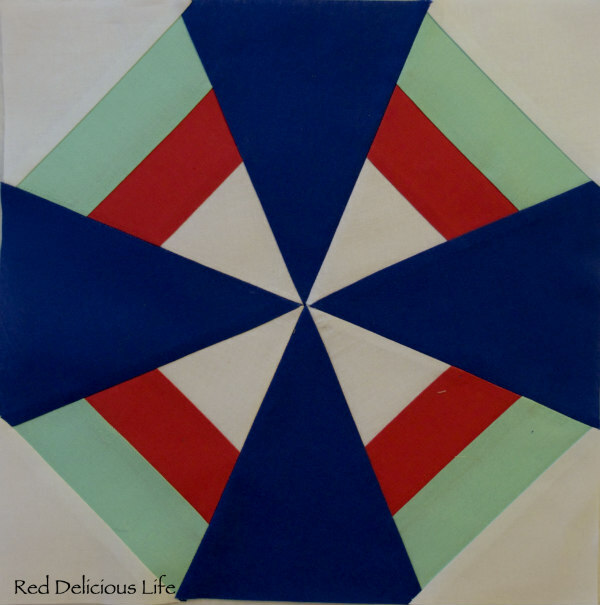 If you go to the end (around 11:45) you'll see a gorgeous quilt made with 2.5" squares. 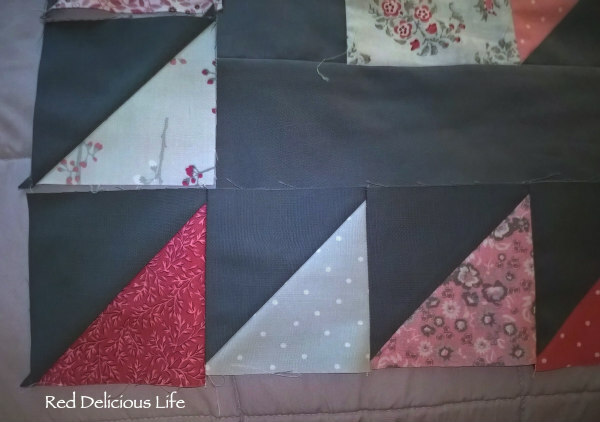 I think this is the perfect way to use up scraps making it a bit bigger with 3 or 3.5" squares. And the bonus - it's a quilt as you go project! Yes, I live in Central Florida, so it's always hot but that's not what I mean. August is a jam-packed month on our calendar. On the home front, we have a new car purchase, an upcoming Disney cruise, the start of kindergarten with all the back-to-school activities like supply shopping and meet-the-teacher events, and we have a trip planned to Holiday World in Santa Clause, Indiana. 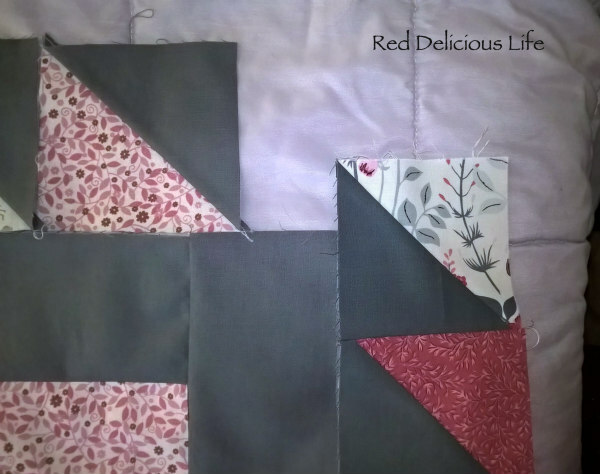 I already have 2 blocks designed but need to test them out on practice fabrics first, and then write up the corresponding tutorials. As you know, I've been working on my niece's quilt. I made a bit of progress in getting the top and bottom borders figured out but I'm still trying to work out the side borders. Given all the other things on my plate, and knowing that I still have my little one at home until August 24th, this project is going to have to be put on the back burner so I can focus on the above mentioned projects that all have August deadlines. After I constructed all of the blocks and decided on this layout I realized that I constructed too many with the gray corner in the wrong place. That was error #1. 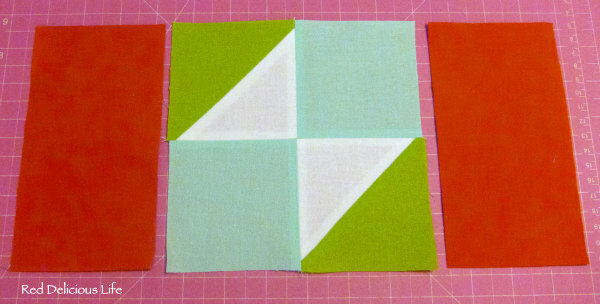 To correct it, I purchased 2 different fat quarters that I thought would coordinate well and made a few more blocks. But it was barely big enough for a baby blanket and I wanted it to be bigger. I had a slew of leftover half square triangles so I tried to figure out how I could incorporate those into the design. GRRRRRRR..... I WILL MAKE THIS WORK SOMEHOW. I've only pieced together one side of the houndstooth border. I'm going to piece together the opposite side with the exact same number of squares as well as a 3rd side to determine how many squares I'll need to connect both of the sides. I have a feeling I will end up trimming down the gray border to make all those blocks to work. But there you have it in a nutshell - if I could do math, I might not be in this predicament. And it's also why you won't see me designing a full quilt with complicated borders.